Time for Barefoot Bloggers! I have missed participating in this group for a while and am excited to be back cooking delicious Ina Garten recipes with everyone. The second recipe for February, Ina's Baked Shrimp Scampi, was picked for the group to try by Jill of Insanely Good Food, thanks Jill! Since scampi is apparently an Italian word for large shrimp or prawn, vegetarian scampi doesn't really fit but oh-well. I was toying around with lots of shrimp substitutes for this one, tofu? Mushrooms? Nah, I was in a pasta mood, and figured the kids would be more likely to eat fettuccine than tofu. So instead of serving shrimp scampi with fettuccine, I used the fettuccine as a shrimp substitute. It turned out wonderfully! The cooked fettuccine was tossed in a garlic infused olive oil and white wine, then topped with a buttery panko bread crumbs, herb, roasted garlic, and lemon mixture, then baked until the top was golden brown and crunchy and the noodles were tender and loaded with flavor. 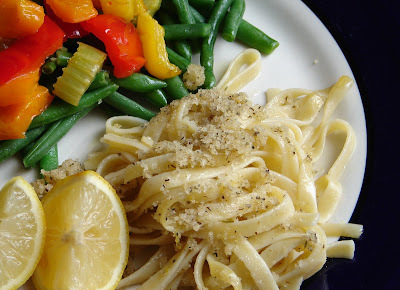 I absolutely loved the pasta and the kids did too, they especially had fun squeezing lemon wedges over the pasta to give it some extra lemon kick -- my kids love lemon! 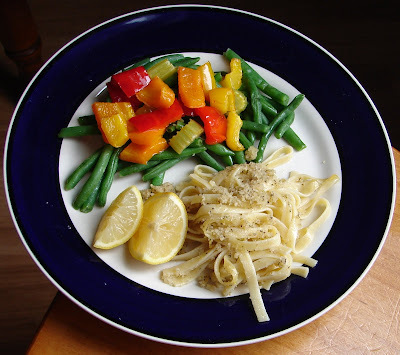 On the side I served another Barefoot Contessa recipe, Ina's French String Beans, which were divine! For that recipe I changed up a few little things, using triple the amount of peppers and subbing out onions for celery, which may sound like a strange sub, but we were out of onions and always keep celery on hand (another favorite of the kids) so I figured I'd roast it with the peppers and it turned out perfectly. 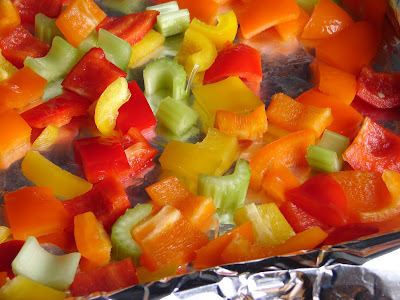 The peppers were sweet from the roasting and the celery added a nice crunch. This is a perfect veggie side dish that can be personalized with many different veggies, I'm thinking next time I'll roast some cherry tomatoes and mushrooms along with the peppers. Cook the pasta in salted water until al dente and rinse under cold water when done. 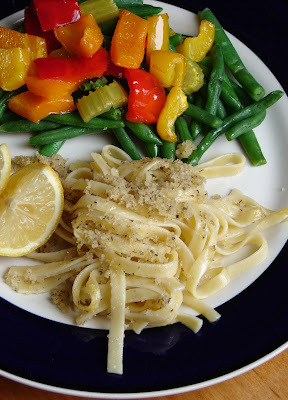 While pasta is cooking, mash together the softened butter, roasted garlic cloves, herbs, lemon zest, and panko crumbs. 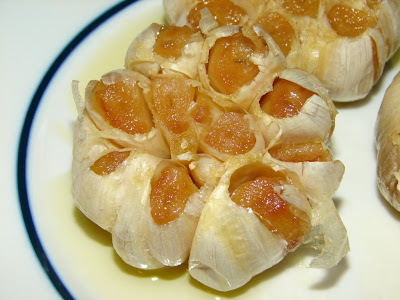 Perfectly roasted garlic thanks to my Roasted Garlic Express, yum! 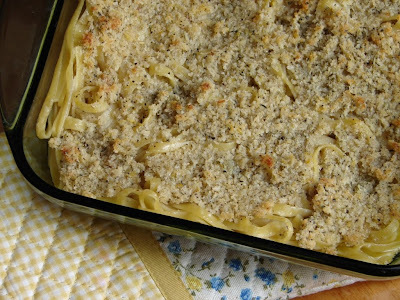 Put the pasta into a 8 inch square glass baking dish or similar sized casserole dish. 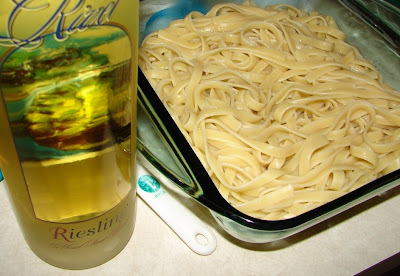 Toss with the garlic olive oil and wine. Spread the butter crumb mixture over the top of the pasta, bake at 435 for about 20 minutes, or until golden brown. This is a little messy to serve so my best suggestion is to cut a square of pasta and then remove it from the dish to your plate with pasta or salad tongs, trying not to loose too much crumb topping. Serve with lemon wedges. At first I was a little nervous this would be bland, but it was so flavorful and the buttery garlicky wine sauce was perfect with the crunchy panko topping. I'm betting this dish would be amazing with homemade fettuccine, I was going to make some to do this dish with, then I opted to just use boxed Barilla pasta because I didn't want to "waste" homemade pasta with a dish I didn't know would work or not. Silly me, it would have been perfect!